It’s not news that for many people an insole, orthotic or support in their shoe will make their feet (ankles, knees, hips, backs . . . ) more comfortable. Many people can tell a story about flat feet, fallen arches, ankle pain, Achilles Tendonitis . . . . this could be a very long list! So whatever else an orthotic does it must support you when you are MOVING! If your orthotic creation process starts with an image of your feet when you are sitting or standing still how is it going to help you when you move? Feet change when you walk – your high arch collapses mid step, your ankle shifts to the right as it makes contact, your toes flex up as the ball of your foot hits the ground . . . . There are a millions variations but do you know the one thing they all have in common? They happen when you MOVE. So a plaster cast of your feet taken while you sit or stand might look nice but it doesn’t help design an orthotic for when you MOVE. Before making any decisions it is important to do a proper consultation and a gait analysis. Then we can make choices depending on what is right for you, your feet and your lifestyle. 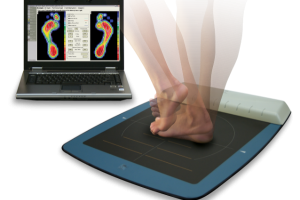 These are custom made, personalised orthotics created to a prescription generated by a specialised mat with 2304 sensors to assess exactly how your foot makes contact with the floor. These can be made to be either super slim and discreet or with greater support for athletes and every option in between. Custom made by podiatrists in Ireland with the latest biomechanical technology and materials these are the Ferrari of orthotics. Simple to use and quick to fit these are a great option for a wide variety of people. They come in a huge range of options including ¾ length for high heels and dress shoes, through sturdy Industry and super soft Diabetic options all the way to specialised versions for golfers, runners, footballers and skiers. Formthotics are also a great choice for younger people and children with a range that starts from as young as 3 years old and includes sturdy and sports options. Perfect for those young athletes to prevent injury and reduce recovery time without breaking the bank if they accidently get left behind! What both of these options have in common is that they are personalised to YOU. Footmaxx are made to a highly technical prescription. Formthotics are thermoactivated and personalise to your foot as you move and use them. Being based on the South coast of Spain we have some slightly different challenges to those faced by our Northern colleagues – not least that for 3 – 6 months of the year no one here wears shoes! And the best pair of orthotics in the world can’t help if they are in the cupboard. 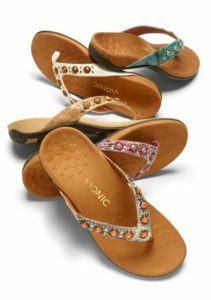 So we use Vionic Sandals. A fabulously comfortable footbed, incorporating a deep heel cup, good arch support and a 1st ray cushion, these sandals provide a good level of support that is appropriate for most people. And best of all, they don’t look like orthopaedic shoes! 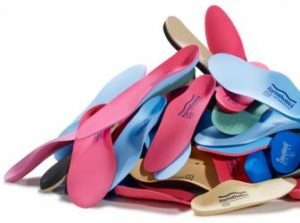 So if you can’t wear your orthotics – wear these!